One career path that has always interested me is the path of running an online business. What sticks out to me about running a business is that I get to be my own boss, set my own schedule and do multiple different things. I have never been the type of person to sit and do one thing for hours on end. That’s why I decided to start an online business. Today, I’m going to talk about how I got started as well as what my new business is all about. I started blogging more than three years ago, and while I cringe at the posts I wrote back then, they were great in that they got me writing and posting things online. I was a blogger before I even thought about what business I would want to start, and I am extremely grateful for the blogging world. Writing blog posts helps with your business, because it adds to your website. You have more than just an about page, a contact page and a sales page. You have all these pages with all of these posts. According to various SEO experts, the more pages your website has, the higher it will rank in search engines. More pages means more ways to get found. You can, and should, also use your blog to position yourself as an expert in your niche. If you want to be a freelance writer, start writing posts on how to write. My business strives to help young women be inspired and to get organized so that they can lead their best lives. So, that’s what I write about. Social Media is (Also) Everything. While it is not the same as a blog, you should be on a few different social media sites. Social media is a bit harder to control than your own website, because you won’t have a say in Facebook’s new algorithm. You do have a say in the content and layout of your website. Still, a social media presence does wonders for an online business. More and more people are utilizing social media to find recommendations on products and services. Hashtags are becoming a great way to find clients and connect with brands. Pinterest is perfect for bloggers and online entrepreneurs, because people go to Pinterest in search of something. That something might just be your product, but your audience won’t find it if you aren’t on Pinterest. In order to really rock social media, pick two to three networks to focus on and build your brand with. I, personally, use Facebook, Twitter and Pinterest, and each serves a different purpose. Research Your Product or Service. Before you start creating your product or nailing down your service, you have to make sure there is a demand for it. Ask on social media or do a Google search to see if people are in need of what you have to offer. Research some competing business to see what they are doing. Look at their sales or product pages. How much are they charging? What do you get with your order? What can you do to stand out? I haven’t been the best at asking if my product is in demand, I used Google to find out if it was even worth it, and then I looked at the prices of competing shops. I didn’t copy any of my competition, but I did get to see what I could charge and also what I need to put in my product listings. Whether you want to write a full business plan or just list out your products or services to offer, having a plan in writing is a great motivator. When making a plan, figure out what you need to do before you launch, during the launch period, and after the launch. These things will be different based on whether you are selling a product or service, and you can figure out what other people have done by searching “How to Launch a [insert your product/service here] Business” on Google. If you want to create a business plan, you can either search for templates on Google, or I really like this template from ByRegina. You can only plan so much before you actually launch your business; that is something I have learned the hard way. Sometimes you just have to do something, whether you are ready or not. One of my own flaws as an entrepreneur is that I have a hard time planning to launch something, be it a new business or just a new product. I never know how it’s going to end up, and so I think “Oh, I’ll do it next week.” or something like that, but I just have to push myself to just do it. Just post that new product online. It is definitely a difficult thing to do, but I know that it is totally worth it. Now for the details of my new business! In case you don’t follow me on social media, I launched some printable quotes on Etsy! I will be creating and posting more printable quotes and even some organizational printables in the next few weeks, and I am so excited! This business is something I have wanted for a long time, and is finally here! I am going to be promoting the heck out of it on this blog and on social media, too. So be sure to follow me so you know when new listings are published! If you want to start your own Etsy shop, use this link to get forty (40!) free listings! *If you use this link, I also get 40 listings. 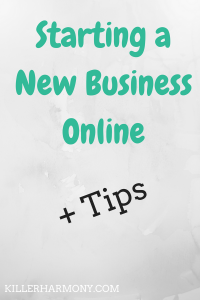 Have you started your own online business? What advice would you give to aspiring entrepreneurs? Leave your answers in the comments! As part of my monthly series on career preparation to be done during college, I am going to talk about finding work for after college. I have talked about making a decision of what to do after graduation as well as preparing a resume and other topics that build up to this. Today, I am going to talk about figuring out what you want in a job as well as how to find those dream jobs and apply. I cannot yet explain how to get those jobs; that will be a topic for another day. Here are my tips for the post-college job hunt. You are not always going to be stuck with a job in the field of your college major. I will graduate with a degree in music, but I don’t plan on establishing a music career. So, think about your interests, both in and outside of your major. What would you enjoy doing? What would you really dread? Thinking about what you want to do everyday is an important step so that you don’t waste time looking for jobs that you won’t enjoy. 2. Start Job Searching Early. Even if you don’t graduate for a few months (or more! ), don’t wait to look for jobs. You don’t have to start applying right away, but searching for jobs early on gives you a good idea of what to expect. If you are interested in a more niche industry, searching for jobs before planning to apply can give you information on what is even available. It will also make you more realistic in your search if you know what results you will find. You can start with a broad search on Google or you could start with online job boards. There are general websites such as Indeed or Monster, or you can find job boards in your niche. If you want to be a freelance writer, the Problogger job board is great. You can also join a professional organization in your niche for use of their job board. Now that you have seen some examples of available jobs, it’s time to read those job descriptions so that you can make your resume as close to perfect as possible. One of the most important resume-related tips when it comes to job searching is tailoring your resume to each job application. What I have personally done, is created a few basic resumes for different types of jobs, such as writing or social media. I also add the date so I know when they were updated. This method makes it super easy to apply, because you already have a resume that is suited for a particular job. You may not have a social media or writing resume, but think of the different jobs you might apply for and write your resume with those jobs in mind. 4. Work While You are in College. If at all possible, try to find a job or internship for your last semester or year of college that is related to what you want to do after graduating. I am an opinion writer for my school’s paper, which yes I do get paid for, but either way, it is experience for me to put on my resume. Working when you are in college also means more money in your account for when you graduate and you also get a feeling of what it’s really like to work in your industry of interest. You can work on campus or off, or you can even find a job online in some cases. Working and saving some money during your last bit of college is also a great thing to do if you want a break between full time student and full time employee. If you don’t have to worry as much about earning money right after you graduate, you can focus on spending some time with friends and family before you commit yourself to a full time career. Whether those connections are with professors, classmates or people you meet online, connections are incredibly valuable when you go to search for a job. I love using Facebook groups to connect with other bloggers and writers all over the world. You can use these groups as job resources, too. Also, don’t hesitate to find groups on Facebook for your industry and participate! This is especially important if you aren’t going into the field of your college major. Ask and answer questions regularly. Follow influencers in your niche for industry news. Educate yourself so that you can become an influencer in your own right. 6. Apply, but Be Selective. Now comes the time to apply for jobs after college. This step usually happens a few months before you are able to work full time. For some this may mean a few months before graduation, for others this might mean around graduation, if you choose to take some time off. When you do apply, don’t just apply to every job you qualify for. Think back to the jobs that looked most appealing to you, and apply to those. If you know you wouldn’t enjoy working in retail, don’t apply for retail jobs. Also, don’t be afraid to apply for jobs where you don’t fit all of the qualifications. If you fit most of the requirements, use your cover letter and resume to sell yourself. Talk about how you could learn those remaining skills quickly or how you have learned similar skills without actually earning a required degree. If you are truly interested in a job, that will show in your cover letter, so be bold. Have you started applying for jobs for after college? What have been your biggest struggles? Any tips I missed? Comment below! 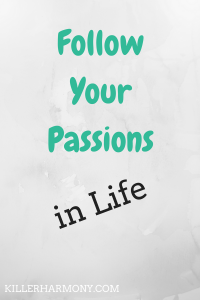 In school and at home, we are often told to follow our passions and that we can do anything. In college, it’s time to actually choose what we want to do. Whether you are a high school senior or you are halfway through college, this post is for you. I chose to major in music in college. At the time, it seemed like a good idea. Music was about the only thing I truly enjoyed and could see myself doing for the rest of my life, but things have changed in the past few years. One of those things is discovering a love for blogging and social media. I had been into creating websites since I was thirteen, but I was almost ashamed of my interest in it. I have also wanted to be my own boss since I was twelve. I’ve had both of those passions for much longer than classical music. I am lucky to be finishing college in the *typical* four years, but if there is one regret, it would be to have majored in digital media or communications or some other related field. I wrote a post a couple of weeks ago on making a post-college decision, and while I am still not ready to announce my decision for the whole world to see, I will say that it does not involve a professional music career. Living as a professional musician would involve too many sacrifices, and quite frankly, music has lost its spark for me. I can’t even practice for very long without thinking about this blog. What post should I write next? What sorts of products could I sell? Those are also the first and last thoughts I have everyday. Music will still be a huge part of my life, but I am completely fine with being an amateur. If you are struggling with picking a major or with finding your true passions, here are some tips. 1. Think About All of Your Interests. Don’t just narrow it down to the subjects you study in school. I never took a digital media class, but it is now my biggest passion. Not every possible career or major is taught at the high school level. Don’t suppress an interest just because you don’t think your parents will approve or because it’s weird. It could be the perfect thing for you. 2. Consider the Time Commitment. If you are passionate about something such as music or dance or theatre, there will be hours outside of classes where you will be required to practice and perfect your art. Can you handle that? If you hardly ever pick up a book in your free time, you probably shouldn’t major in English literature. If you are excited about the work, then you might have found your calling. 3. Think About Careers for Your Major. What sorts of jobs are out there for your field? Are they competitive? How well will your major prepare you for these careers. If you are in school, you most likely have access to a career center where you can talk to someone about your options. 4. take an Interest Questionnaire. If you have no idea what to study, look around online for a career or interest quiz. While these quizzes are not set in stone, they could lead you to something when you don’t have anything jumping out at you. Some quizzes will ask about what you want in a job or what you value as a person. The questions can get weird, but it is always a good start. My most important tip is to be flexible. If you only follow one of my tips, please let it be this one. As I said in the first part of this post, my biggest regret is not following my new passion for blogging once I learned I had it. If I had any more time in school, I would probably switch to a major in communications or marketing, but since I am able to graduate in a few months, it does not seem worth it. I rediscovered blogging and website design/creation about a year ago, and I wish that I treated it as more than just a second interest. I wish I would have switched to a more complementary major. Please don’t make my mistake. If you are like me, and you discovered a passion and it is to late to follow it as a major, don’t fret. All you have to do is figure out how to show your passion and experience on your resume. Look at the basic skills that you have learned. In my music classes, I have learned how to write and how to work with people. Those are skills that can follow me to any career. I have also been blogging to some degree since my freshman year of college. I can put that as professional experience on my resume. Find ways to get that experience so that you can go into your desired field and feel prepared. If you find a new passion later on in college or after graduation, don’t get discouraged. If you feel that working in a new or different field is what you really want, then do it. Odds are you won’t be happy working in your degree field if it is not what you are truly passionate about. As much as I do love music, I have come to realize that the professional music world is not for me. I am able to revisit some of my biggest passions that music put on hold, and I am forever grateful. Even though I may not be working as a musician, I know that my music degree will take me far, and I plan to keep working toward my goals until I achieve them. Have you changed majors or careers to follow your passions? What was your experience like? Let me know in the comments. Welcome to my first post of November 2016! I can’t believe it is already November. When I was brainstorming about what to write for this week, I thought about doing an update/response to my old post about Blogger vs. WordPress (.com). 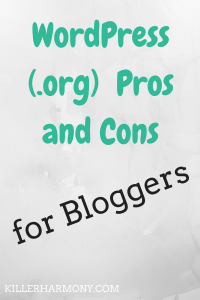 I then realized that since it has been months since I have used either of those, a list of pros and cons of WordPress (.org) would be a much better post. If you are considering starting a website or moving an existing one to WordPress, read on. This post contains affiliate links. That means that, for no extra cost, your purchase of one or more of these products helps to support Killer Harmony. NOTE: This post refers to the free open source version of WordPress (.org), not websites hosted through wordpress.com. WordPress is a very diverse platform. You can use it just for blogging, you can set up an online shop, or you could build an all-inclusive website filled with whatever you want. You can also add different plugins which increase the functionality of your website or blog. Roughly 1 in 4 websites are set up through WordPress. That means that it is very easy for you to find tutorials and other information on the platform (such as this very post!) with a simple Google or Pinterest search. If you have any problems getting everything set up or if you have questions down the line, someone has probably been there before and can help you along the way. There are forums, chat rooms and even Facebook groups where you can go with WordPress related questions. And no question is a dumb question. 3. It’s for Everyone, techie or not. You may be hesitant to start using WordPress, because you think that it requires a lot of coding and other tech knowledge. Well, that is not true. There are multiple ways around having to work with the more technical side of things. You can use plugins or even hire a designer who works specifically with WordPress. You don’t ever have to touch the code of your website. If you need to add a certain function, just search for a plugin that can do the job for you for free or cheap. 4. It’s A Software, not a Web Host. You can use WordPress with many different hosting companies, so you can find something to fit your budget and other needs without having to sacrifice being able to use it or not. Also, if you outgrow a host or happen to have problems, you can take your website with you. If you are looking for a reliable, budget friendly host, I recommend SiteGround. Their plans start at just $3.95 for the first year and are only $9.95 per month after that. I love the service they provide, and they offer a great value at a great price. 1. It can Get Expensive. Whether you choose an expensive hosting package or you splurge on all of the best plugins, you can end up spending hundreds of dollars on your website. If you go into it without any direction, it is easy to get wells deep into the world of WordPress and you can spend your whole paycheck in one day. If you are careful and you know just what you want, it is easy to stay within your budget and not spend a ton of money. 2. It has a Learning Curve. While it is easy once you get used to it, WordPress can be hard to learn. There are so many different things you can do with it, and all of the new information can be overwhelming. As I am writing this, I look at the list of options that I have, and it is monstrous. Compared to a program like Blogger where it is pretty simple, WordPress can be confusing at first. 3. There are a Lot of Options. If you are the type of person to experiment with different things, WordPress is not for you. There are thousands of different plugins that you can play with, and if you don’t have a vision for your blog, it can be time consuming to go through those plugins. There are also dozens if not hundreds of different themes to choose from. In some cases, options are a good thing, but they can hold you back from actually improving and promoting your work. 4. It’s a Software and Not a Host. Yes, this is both a pro and con of WordPress. If you want to have everything in one place regarding your hosting and your actual website, WordPress might not be for you. If you really want to work with WordPress, you can use one of the upgraded plans through wordpress.com. However, it will not be as flexible as the open source software, because it will not have access to plugins or certain themes. If it is worth it to you to use install WordPress on a website that you create through a different hosting platform, do it. WordPress is great, and I believe the pros outweigh the cons. If you are hooked and would like to purchase hosting, please consider SiteGround. It is the hosting company that I use, and I am extremely happy with them. Can you think of any other pros and cons? Let me know in the comments! How to Clean Your Flute: What, When, Why? Should You Sit or Stand to Practice?